Stand-up comedian Chris Garcia is teaming up with the Lonely Island to develop a sitcom for Fox, Variety reports. The show will reportedly be based on Garcia&apos;s real life story as the son of Cuban-American immigrants in Los Angeles who lied about their address to send Garcia to a school in a better district. From Variety: "... he has to make the most of his high school experience despite being surrounded by affluent, white surfer kids—and his dad who is taking ESL classes at the same school." Garcia has been an up-and-comer on the comedy scene for a few years now after being named a "comic to watch" by the San Jose Mercury News and a "rising comedic star" by SF Weekly. 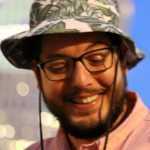 After returning to Los Angeles from San Francisco, Garcia has made appearances on Comedy Central&apos;s At Midnight, and told a moving story about his father in a segment for This American Life. Andy Samberg, Akiva Schaffer and Jorma Taccone, who together make up the comedy group Lonely Island, are serving as executive producers through their production company Party Over Here. The pilot was written by Garcia and Modern Family writers Paul Corrigan and Brad Walsh, who are also executive producing. Garcia&apos;s first comedy special, Laughing And Crying at the Same Time, was released on iTunes earlier this month. Video: The Lonely Island "Diaper Money"